We have a LOT of medicine in our cabinet! 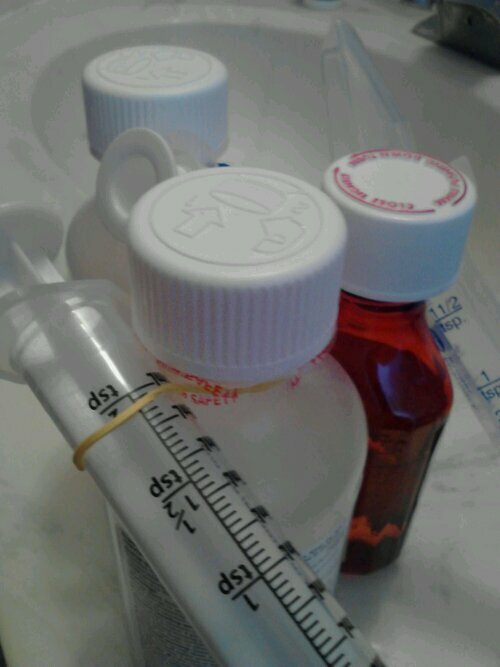 Most of the medicines for the kids need different spoons or syringes that fit uniquely to a specific bottle. Since I really don’t like having to remember which measuring device to use while holding a sick child in one hand and sorting through with my other hand, I came up with a quick solution. 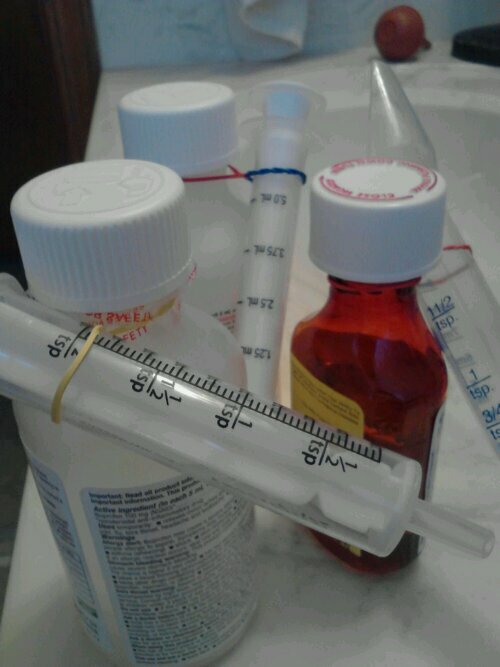 I attached small bands around the necks of medicine that needed it and slip the syringe or spoon through the band! The band hugs the spoon to the bottle and also allows for it to dry after washing. Wow! It is quite a feat to start a business, let alone start it Don’t Buy A Thing style! Over the last few months I have been considering opening an online store that carries products from my blog as well as other products I have been making. After much prayer, I felt I should go ahead with it and I did! I hope you will check it out and give some feedback! I am still adding products, so right now the choices are limited, but I am so excited to be creating and sharing my everyday items with the world (well, just the US for now). You can reach the new store at http://hyenacart.com/stores/oldliferedesigned/ or by clicking on the picture above. Reusing and upcycling in projects does not give you a free ticket to become a pack rat. I spent all day cleaning and de-cluttering my office in preparation for baby #2 to move out of our bedroom and into his own room. It is a nightmare trying to figure out what to do with everything, mostly junk, that I don’t need or want but can’t seem to get rid of. You have a least one box of “stuff” that is just memorabilia that never made it into a scrapbook. Face it, how can you get rid of pictures even if they are really out of focus? Lately I have been really enjoying repurposing items around the house. However, there is more freedom in being able to let go of an object (throw it away, recycle it outside of your home, give it away, etc.) than in keeping it in hopes that you will work it into your schedule. There is more freedom in knowing that you can say “no” to stuff lingering in the corners, filling the closets, and causing love ones to stumble. There is more freedom in having a clean, uncluttered room, than in having a room filled with junk you don’t know the extent of. Can you say no to stuff? It is so hard, but it is SO much better. This passage says more than just becoming poor in order to be a Christian. Jesus knows that because the rich man is “very rich”, the man is more focused on keeping his stuff than what is really important, following Jesus completely. He is a good man, but can he really get rid of his distracting possessions in order to commit to the truth? Having too much stuff is confining whether you believe in Jesus or not. It can take time away from your family because you have to clean all the time. It can be stressful and cause health issues if your house is not very clean, or if there is mildew growing. I have too much stuff. I grew up in a family that kept stuff. It is heredetary. It is easy. It is UNNECESSARY. I am still working on it and still have too much of it. I am not perfect and I know that stuff is causing problems in my life. Oh to live simply! Get rid of your stuff. Don’t be a pack rat. I mentioned in an earlier post that babies have so much poop. It happens right when you put a new diaper on, or sometimes in the process of putting the new diaper on AND THEN in the new diaper. Since I don’t have time to change the changing pad cover AND the babies clothes, diapers, my clothes, etc. I decided to make changing pad cover SAVERS! 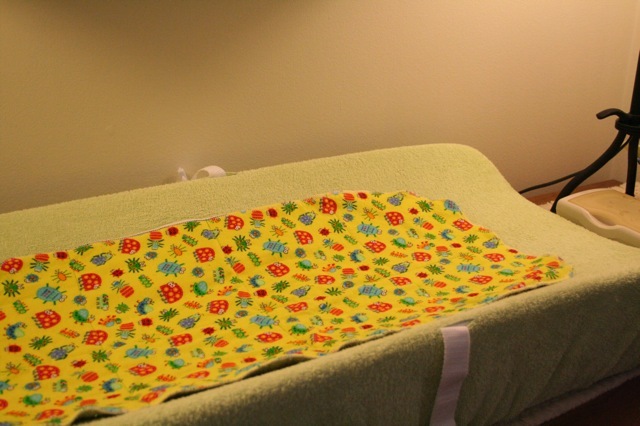 A changing pad cover saver SAVES your sanity along with the changing pad cover some of the time. All you do is lay it down on top of the cover and then replace it with a clean one if it is soiled quickly. You could just lay it on the pad without a cover underneath, but it might slip around since nothing is holding it down. To wash, just throw it in with the cloth diapers or other laundry. 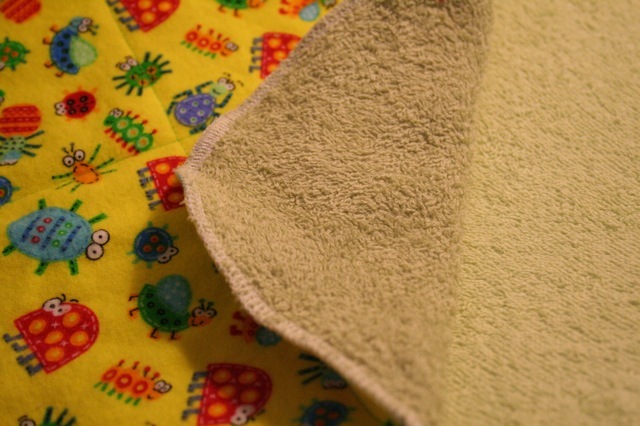 For my savers I used two layers: a layer of flannel and a layer of terry cloth for absorbency. I surged the two pieces together and then sewed lines on it so it wouldn’t shift in the wash. You can also sew right sides together, turn and topstitch, or just put a towel down without sewing anything! Your new savers can even be used as on-the-go changing pads. Compost is wonderful! It works for anyone, no matter where you live, and only needs a small outdoor area to mature. You can do it! You know you’ve always wanted to try it but got overwhelmed with knowing how to start it, where to keep it, and when to do what to it. 1. What goes into compost? “Green Material”: Basically, any uncooked kitchen vegetable scraps that have not touched meat juices can go into your pile. You can even place eggshells that are rinsed well. If you have a large compost pile you can add grass clippings. Having meat products in a compost pile attracts pests and can harbor disease when rotting. We want our compost to BREAK DOWN, not mold, rot, and stink. A good compost pile NEVER stinks. “Brown Material”: You can use dry brown leaves, shredded paper from your office, or newspaper. The brown material helps the compost stay moist but NOT WET. If your pile does start to stink, it’s usually because the pile is too wet. Add more brown. Dirt: Add some dirt. You are adding very LITTLE dirt to your pile, but it contains some microorganisms that will help break down the green and brown materials. Sunshine: Direct sunlight on your compost pile is essential. The sunlight heats up the ingredients and helps the mixture break down. If your pile starts to mold, it’s usually because the pile is not warm enough or needs turned. Stir it up and give it some sun! 2. What supplies do I need? A clean food-safe container to hold kitchen scraps. I used a pretzel container, but an ice cream bucket works really well. Don’t keep the lid on, you don’t want it to start rotting in the kitchen! Small house/Apartment: A 5 gallon bucket with LID for the compost. This is small enough to fit on your patio and small enough to roll around for mixing. Once you get the hang of it, you can add a second bucket when the first gets full. Large house/Small house: A plastic garbage(preferably black) can with LID for the compost. Because this is larger than a bucket, you will need a shovel or pitchfork to mix ingredients. Extreme composters: An area in the yard separated into three large sub-areas. One is for new compost, one is for a year old mixture, the last is compost that is ready to be used in the yard. Just rotate the areas each year. Take your bucket and poke some holes in the bottom with a nail and hammer (about 1-15). If you don’t have a black bucket, paint the outside black or a dark color. This helps the compost heat up. Add green, brown, dirt, green, brown, dirt. Repeat. Place your bucket on a few bricks or on a patio in a sunny area. The bucket will need to drain, but there is not too much liquid that comes out. Roll your bucket once a day or whenever you add new scraps. When you add new kitchen scraps (green), don’t forget to add some brown and some dirt. YOUR COMPOST IS READY when it resembles a coarse dirt mixture. Pieces are no larger than the size of a penny. USE YOUR COMPOST mixed with soil to make your own nutrient-rich potting mix, or on top of soil after planting (instead of mulch). It is as rich as fertilizer! Collecting kitchen scraps keeps your kitchen garbage from smelling before it is full. Compost itself is cheap or free because your ingredients are usually readily available, and are more natural than store-bought fertilizers or growth enhancers. Here are some links to additional pictures and how-tos if you want more detailed information on composting! Due to limited counter space, I decided there was no place for my cookbook on the counter when I was using a recipe. Easy fix: Use a music stand! I placed the cookbook on the stand and have kept it there ever since. The stand also keeps the book clean and can move around the kitchen with me. I also chose to replace an overstuffed, unorganized recipe box with my easy-to-use recipe photo album. The album was just a 200-4×6″ photo album. You could easily use a 3-ring binder with vinyl photo pages or a different size album. 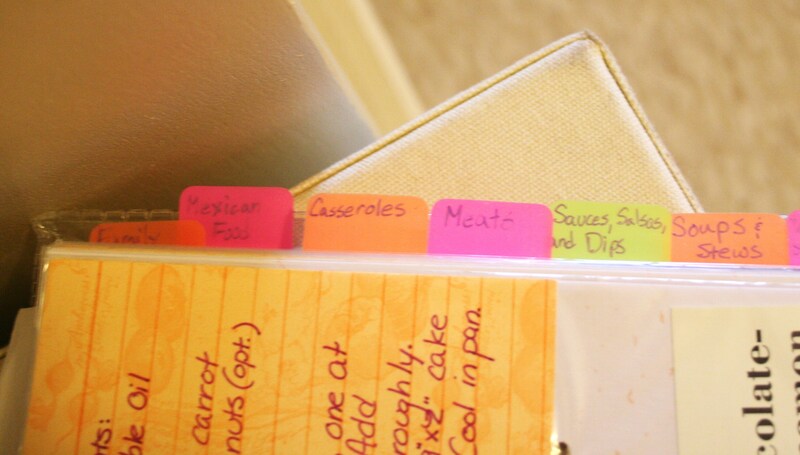 A photo album allows me to see exactly where the recipe card needs to return to and is easier to flip through. 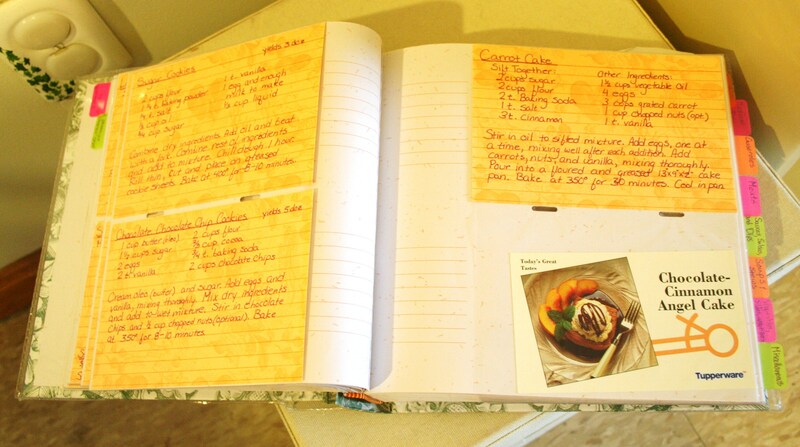 The album can fit recipes that are not on my cards such as store recipes, magazine clippings, and printed recipes. I used tabs from an old year planner for the category dividers. What kitchen organization tools do you use?